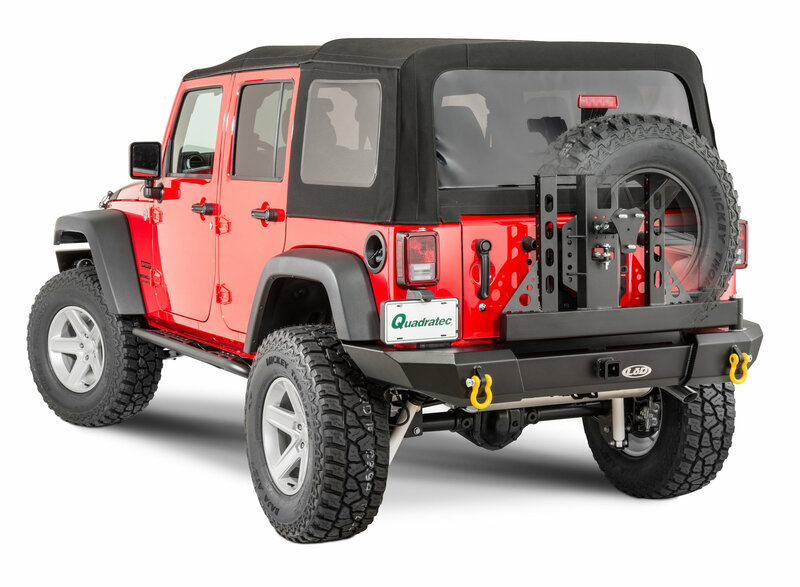 The Signature Series Rear Bumpers are precision built with CNC laser cut and formed parts and are available with a standard swing out tire carrier or linked carrier. The standard carriers adjustable toggle latch provides a secure rattle-free latching system. The linked tire carrier is attached to the tailgate and when you open your rear gate, the carrier system simply follows along. Constructed with a combination of 10 gauge, 3/16, and 1/4 steel plate and include an integrated 2 receiver that ties directly into the rear cross-member of the frame. 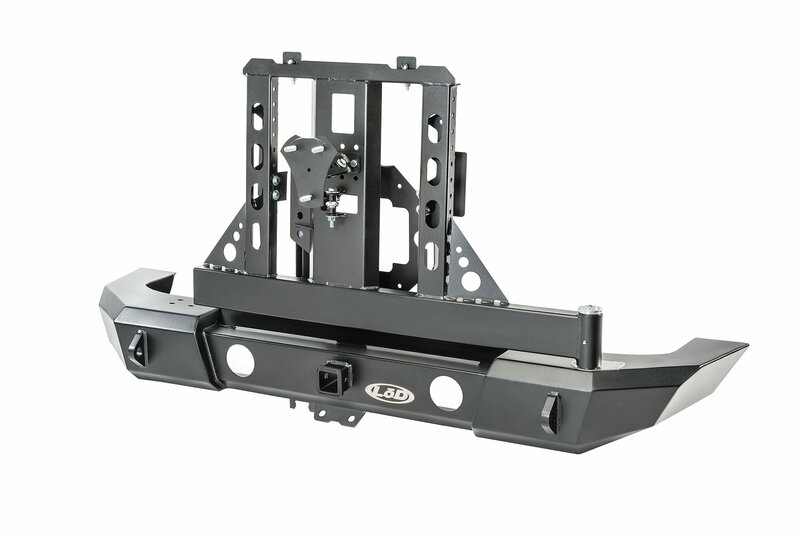 Bumpers also come standard with two fully welded shackle mounts that accept 3/4 D-Rings. Optional Rear lamp kits can be purchased separately. 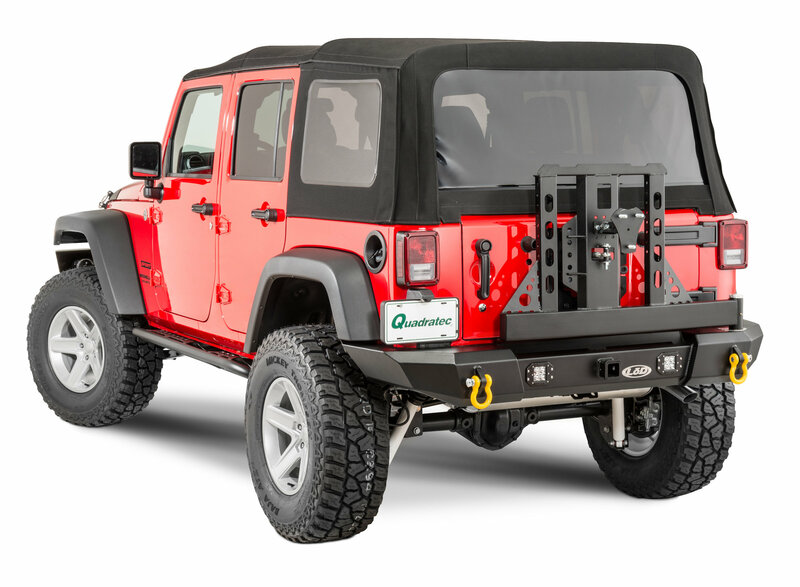 Systems provides brackets to carry a Hi-Lift jack and are designed to add optional accessories (sold separately) which include traditional Jerry Can Mounts, RotoPax Mounts, Trail Rack and an Adjustable Third Brake Light Kit. LoD products carry a limited lifetime warranty against mechanical failure and a 1 year powder coat warranty. Made in USA. Nice bumper but does rattle. Instructions for installation are terrible. Not all the parts provided are even mentioned in the instructions. The hole for the grease fitting was not tapped. I'm assuming whatever is rattling in the bottom of the tire carrier is scrap metal from manufacturing. I can adjust and modify the tire carrier to stop the bushings from rattling and align the carrier a little better but I shouldn't have too. I would not recommend this bumper based on the poor installation instructions alone. The round lights aren't very bright so go with the square light cutouts. The bumper itself is custom made so expect a couple weeks for shipping. It's worth the wait. The bumper was smooth to install and only requires a couple of holes to drill. The best part is that this is 100% rattle free. Couldn't recommend a different bumper.